It was unexpected, it was thrilling and yet, in a sense, it added up. Manchester United ran out winners against Juventus in the Champions League on Diwali night, doing what they've been doing of late and scoring late in the game. To say they hadn't been fancied in Turin, a fortnight after losing 1-0 at Old Trafford to the same side, would have been embarrassingly accurate. Yet that is the gulf between the two giants of European football these days, in terms of recent trophies and perception. However with the amount of continental talent available to Mourinho, including himself, United were able to effectively manage enough possession through both halves to remain somewhat in control the entire time. It wasn't as though Juventus weren't the better side though. They missed a bucket-load of chances, with Cuadrado's and Khedira's sticking out in memory, and David De Gea made equally as many excellent saves. Dybala was excellent. He is deceptively quick and has a goalscorer's ability to strike. The excellent Victor Lindelof narrowly prevented him from a second rebound tap-in in as many games, and the bar felt the brunt of a shooting star curler. Bentacur looked class in midfield. Manchester United on the other hand, looked like they were asking for it. Pogba gave it away more than once, something he is prone to do, and Alexis Sanchez didn't really get into it. His free-kick straight into the wall never gave the impression that he knew what he was doing -- and neatly summing his match. The others -- defenders, Herrera and Matic -- however, gave the Old Lady little breathing room. Both midfielders took yellow cards, with the Serbian surely making Mourinho skip a beat for a foul on Dybala. And then, there was Ronaldo. He's perfected himself as an attacker, long-time Manchester United fans would have surely made note. He almost couldn't showboat by the end, only ever intervening for fleeting pass-and-run interchanges, all of which only ever added speed to proceedings. Thrice he looked like he would manage rifle one past United's Spanish keeper once again -- finally converting on the fourth with an almost telepathic connection with the trajectory of Bonucci's looping ball. It was well worth the exuberant praise of the commentators and Allegri's reaction and being the first goal the top scorer in European football has scored for Juventus, significant. It was to be another Portuguese's night however, as Mourinho hooked Lingard for a more direct threat in Rashford and swiftly backed that up with the tall and accurate partnership of Marouane Fellaini and Juan Mata. The Spaniard would strike first, showing once again to be very dangerous with free-kicks from a left-footer's range. 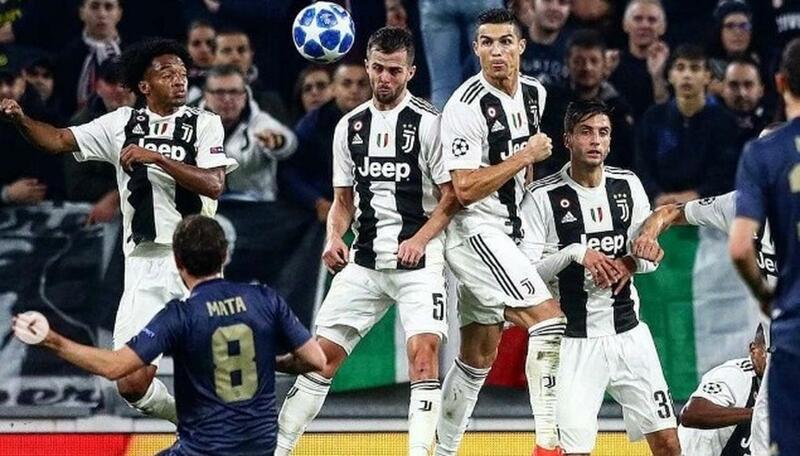 Another free-kick, an inswinger into the Szczesny far post would provide the winner, with at least four players landing in positions that ensured the ball would be deflected into the net, the only question being whether to give it to Fellaini, whose hair had brushed the ball, or one of the unlucky Juve defenders -- likely Sandro -- who got the final touch. United appear to have made a habit of falling behind, then rallying. Second-halves have become infuriatingly superior to the first 45 for fans, and there's a capacity for being uninspiring till they have no choice in the matter. But this Manchester United team has racked up a very eye-catching win, the kind there isn't any arguing against. It's also shown that there's more to it than being a feared attacking force. Manchester City can be nullified, despite their proclivity to win 6-0, the Red Devils would have noticed before the derby this weekend, and they'll will want to settle qualification into the last 16 in Europe at the end of this month when Young Boys come to Manchester and Juventus host Valencia. For the moment United have the wind in their sails and they could start reeling teams in, starting the noisy neighbours. Nemanja Matic - (8) And why can't he play as the fulcrum in midfield with passers around him? Juan Mata (sub. 79) - (8) The spark behind the comeback, Mata made up for his relative anonymity in the reverse encounter. He's clearly Manchester United's best attacker, but will Mourinho start him at the Etihad?